This is another recipe development for the Barker’s Pantry website and is all about creating something tasty with minimal ingredients. When I first had a taste of the Barker’s New Zealand Chipotle Sauce I immediately could taste smokiness and a little heat and it made me think of bowl food. I wanted creamy potato mash with sauce and meatballs…a meal that I could seek comfort out of and eat with just a spoon. This is perfect for week day lunches and you can serve it with some rice or on top of pasta. Place all the ingredients for the meatballs in a large mixing bowl and using your hands, mix everything together. Season with salt and pepper. To make the meatballs, scoop 1.5 tablespoons of the mixture and roll into a ball and set aside on a plate. Repeat with the rest of the mixture. Heat up one tablespoon of olive oil in a large frying pan over medium high heat. Place half the meatballs in the pan and cook them till they’re lightly browned all over. Set aside on a plate and repeat with the other half of the meatballs. You may need to add extra olive oil to the pan. Add one tablespoon of olive oil into the same frying pan and gently sauté the onions and garlic till the onion starts to soften. Pour in the bottle of Barker’s New Zealand Chipotle Sauce and can of tomatoes. Season lightly with salt and pepper. Add the meatballs back into the frying pan and simmer the sauce on low heat for 25 minutes. During this time, regularly spoon sauce over the meatballs to stop them from drying out. 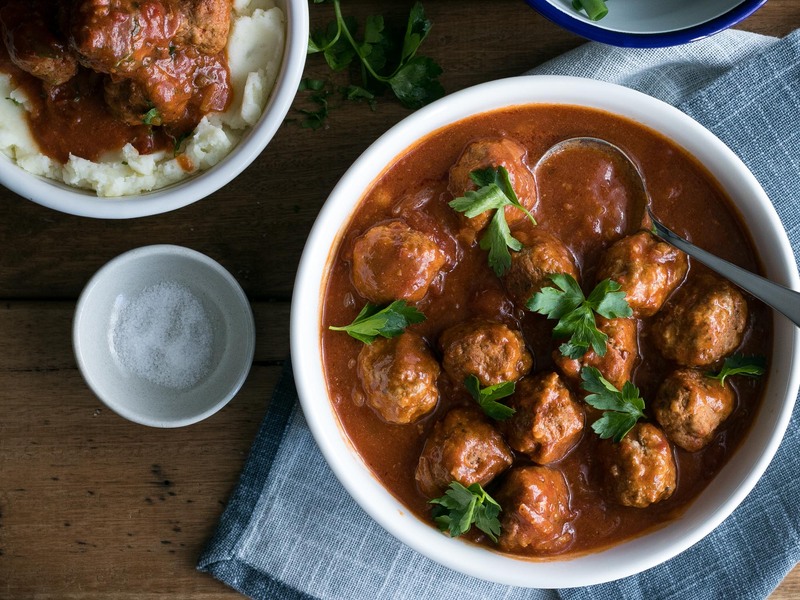 Serve the meatballs warm on mashed potato or with rice or pasta.